As mentioned in our objectives we want to share our research and findings with everyone. Please find below a continuously growing list of downloadable content that you can freely use and distribute. Should you use any of our content and wish to share your event with us please send us pictures as we would love to see them. This brochure was printed for a conference in which ASHA representatives were asked to talk about Australian Sikh Migration. It provides a high level summary on the topic as well as some interesting facts and photos that may be new to the reader. If you would like the digital version ready for printing (crop and bleeds) please contact us. Harjit Singh and Kuljit Jassal from the Australian Sikh Heritage team presented a poster today at the Australian Society of Archivists 2018 Conference titled 'Australian Sikh Pioneers - Revealing a Minority's Place in Australia'. Our poster only briefly covered some key events in the last 120 years of WA Sikh history that has culminated in the creation of the Australian Sikh Heritage Trail. To download high resolution A0 size poster please click on image on the right. This brochure was created as part of the 100th anniversary of Private Saran Singh who lost his life in the Battle of Messines in Belgium on 10 June 1917. If you would like the digital version ready for printing (crop and bleeds) please click here. This brochure was created as part of the 75th anniversary of the Broome Air Raids that took place on 5 March 2017. This brochure was printed as part of creating awareness regarding the Sikh Anzacs. It provides a high level summary on the topic as well as some interesting facts and photos that may be new to the reader. Print out the attached document on A4 paper to allow you and your children to colour in the pictures while following the Australian Sikh Heritage story. 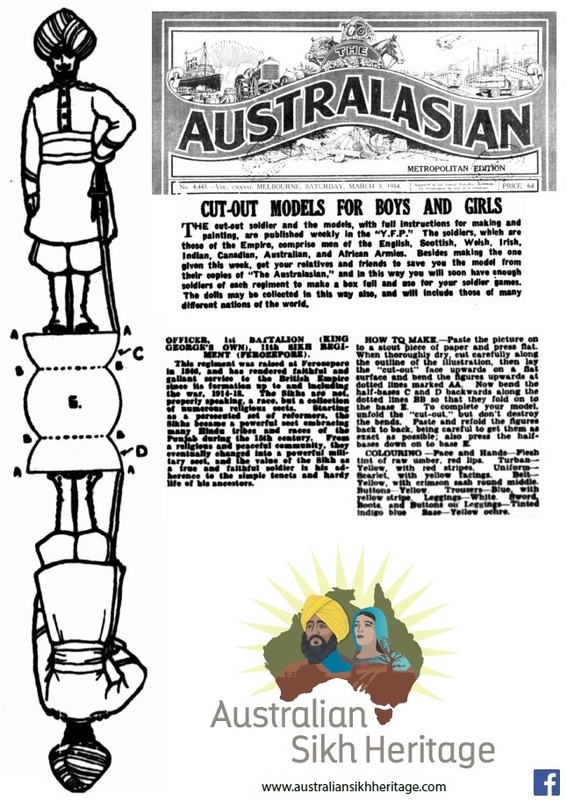 In February and March 1934, the Australasian Newspaper in Melbourne, Victoria printed cut-out models for boys and girls in the main newspaper to allow the younger generation to connect with the rest of the world. As part of this series we come across these amazing depictions of Sikh soldiers. You can follow the instructions to create your very own Sikh toy soldier! It is best printed on an A3 piece of thick card. Alternatively you can print out on normal paper, colour it in and then glue on to a piece of thick card as suggested in the original article! There are two versions to choose from. King George's Own Ferozepur Sikhs or the Governor General's Sikh Bodyguard. To view full article on these images please click here.